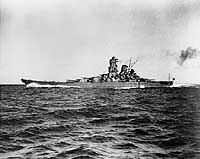 The Japanese Naval Ships section of the Online Library provides ready access to photographs of ships and named craft which served in the Japanese Navy. This page provides links to all Japanese Navy ships whose photos are available in the Online Library. If the ship you want is not listed on this page, contact the Photographic Section concerning other research options. Japanese Navy ships are listed below by name or by type. Scan down the list until you find the ship you want, then click its entry to access appropriate image pages. To the best of our knowledge, the Online Library's pictures are all in the Public Domain, and can therefore be freely downloaded and used for any purpose.